Dr. Youngner’s contributions to virology began shortly after his arrival at the University of Pittsburgh in 1949 as an Assistant Professor. At that time, Dr. Youngner started working with Dr. Jonas Salk on the development of a vaccine for poliomyelitis. A number of significant advances toward the realization of this vaccine, which came to be called the Salk vaccine, followed in a remarkably brief time. In particular, Dr. Youngner’s efforts were responsible for establishment of techniques for the production of poliovirus on a large scale, and he developed the process for the inactivation of the infectivity of the virus without destroying its activity as a vaccine. He also devised methodology for safety testing of vaccine batches, including those used in the first field trial. A simple color test for anti-polio antibodies, used to determine the efficacy of immunization in human subjects was also the fruit of Dr. Youngner’s efforts. It was during the course of his work on the polio vaccine that Dr. Youngner exploited a new and effective technique for culturing cells from animal tissues. This involved the simple expedient of treating tissues with proteolytic enzymes to obtain cell suspensions used to establish primary cell cultures. This method, now commonly referred to as trypsinization is the basis for modern cell culture, and the publication describing this advance, has been cited so often that it has achieved the status of a so-called citation classic according to the criteria of the Informational Sciences Institute. Since his initial early work on the polio vaccine and related topics, Dr. Youngner has continued to make major advances in the field of virology and immunology. In the area of interferon research, Dr. Youngner was the first to demonstrate that non-viral agents could trigger interferon induction in animals. In addition, Dr. Youngner and his colleague, Dr. Samuel Salvin, identified a second variety of interferon that was acid-sensitive and termed it Type II interferon, which is now known as gamma-interferon. 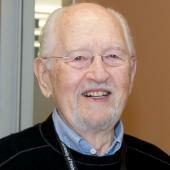 Dr. Youngner also made several significant contributions to the understanding of the antiviral-effect of interferon and was the first to demonstrate the anti-interferon effect of some viruses, particularly poxviruses, a research area that is currently under active investigation in many laboratories. Persistent viral infection has been another field in which Dr. Youngner has made a seminal contribution. Working with RNA viruses, his laboratory developed insights into the factors involved in the establishment and maintenance of persistent infections by virulent viruses in cell culture model systems. The role of selection and amplification of defective viral mutants in the evolution of persistence led to the understanding that many of these mutants were dominant-negative viruses that were able to interfere with the replication of their wildtype parental viruses. Dr. Youngner’s productivity has continued to the present day. As an outgrowth of studies of dominant-negative mutants, Dr. Youngner has devised a novel approach to antiviral therapy. He and his colleagues have demonstrated that the live, attenuated virus vaccine for influenza A is a dominant mutant virus that is able to directly interfere with wild-type influenza virus in animals and protect them from disease. This characteristic is distinct from the ability of the live virus vaccine to induce a protective immune response. This strategy for influenza antiviral therapy may have the potential for a significant impact on the morbidity and mortality associated with influenza infections and may be applicable to other systems. Dr. Youngner and his colleague, Dr. Patricia Dowling developed a live, attenuated equine influenza vaccine that was licensed by the USDA on November 17, 1999. The Heska Corporation of Ft. Collins, CO supported the development of the vaccine and will be responsible for its production and distribution. The vaccine “FluAvert IN” is administered intranasally and is considered by equine veterinarians to be the first effective influenza vaccine to prevent a serious respiratory disease of horses. On April 27, 2017, Dr. Youngner passed away at the age of 96. Dr. Youngner was an iconic figure at the University of Pittsburgh and internationally renowned for his work on the first successful polio vaccine. He also served as Chairman of our Department for more than 20 years (1966-1989), and was a beloved teacher, mentor and friend to us all. He will be greatly missed.